Chen Zijin’s novel The Untouched Crime, translated by Michelle Deeter, was published last year by AmazonCrossing. You can find readers’ comments on the amazon website, and if you scroll down the amazon.co.uk page, you can see that AmazonCrossing made this book available to reviewers on Netgalley. But who better to tell us about the book than the translator herself! A few years ago, Li Jingrui switched careers – she quit her job as a journalist (she reported on legal cases, and had a column in the Chinese edition of The Wall Street Journal) and turned to writing fiction. We selected her short story "Missing" for the Read Paper Republic series, and also featured it in our first Speed Book Club event. The story is about a young woman whose husband mysteriously disappears for a few months, and at the book club this opened up an amazing discussion, drawing comparisons with the wives of los desaparecidos in Chile. We also selected a non-fiction piece "One Day, One of the Screws Will Come Loose" by Li Jingrui for the 2nd Bai Meigui Translation Competition with the Writing Chinese project at the University of Leeds. For Global Literature In Libraries this month, we asked Li Jingrui to tell us about her transition from legal journalism to creative writing. Dream of the Red Chamber by Cao Xueqin is the quintessential Chinese novel. The translation by David Hawkes and John Minford (The Story of the Stone, Penguin Classics) is such a pleasure to read that the Complete Review suggested it as a contender for Book of the Millenium! This much-loved eighteenth-century classic has been adapted for the cinema, for TV, for radio, for the stage and, most recently, as an opera co-produced by the San Francisco Opera and the Hong Kong Arts Festival. So we just had to include it in the GLLI’s China month! In 2016, Ann Waltner, Professor of History at the University of Minnesota, created a free online course Dream of the Red Chamber: Afterlives, with the help of her graduate students. Designed for people who’ve never read the novel before, it’s a great resource – whether you’re reading by yourself or as a book-group. We’re delighted that Ann agreed to write today’s post. Today's post is about contemporary Chinese poetry, and is written by Eleanor Goodman, poet and award-winning translator - her translation of Something Crosses My Mind: Selected Poems by Wang Xiaoni published by Zephyr Press in 2014, won the Lucien Stryk Translation Prize and was shortlisted for the 2015 Griffin Poetry Prize. Happy New Year! - new RPR project starting next week! Happy New Year everyone! Wondering what's in store on Paper Republic in the Year of the Rooster? READ PAPER REPUBLIC's first project of the year starts on Wednesday 1 February and runs throughout the month. The Global Literature in Libraries Initiative (GLLI) invited us to run their blog, and give it a China focus for February. We said yes, as long as we could post the blogs simultaneously on Paper Republic. So that's what we're doing! We'll be posting every day through February. We're incredibly grateful that so many PR contributors and friends have helped us to prepare for this, and we hope you'll enjoy the posts. As usual, please join in and leave comments (especially appreciative ones! and ones that add news or info). The Chinese name of the grant (《上海翻译出版促进计划》 翻译资助) translates more literally as the "Shanghai Translation Publishing Promotion Scheme translation grant". The terms and conditions can be found here. Details of the winners of 2016 Shanghai Translation Grant can be found here. Yan Ge 颜歌 will be at the China Changing event at the Southbank Centre, London, on 16 December. Here, Martina Codeluppi introduces a Young Adult story by Yan Ge, writes about her experience of translating Yan Ge's work into Italian, and interviews Yan Ge and translator Nicky Harman, who has translated Yan Ge's work into English. are there new ones that we should add? NEW RESOURCE: Chinese books for young readers - from Helen Wang, Anna Gustafsson Chen, Minjie Chen - launched this week! 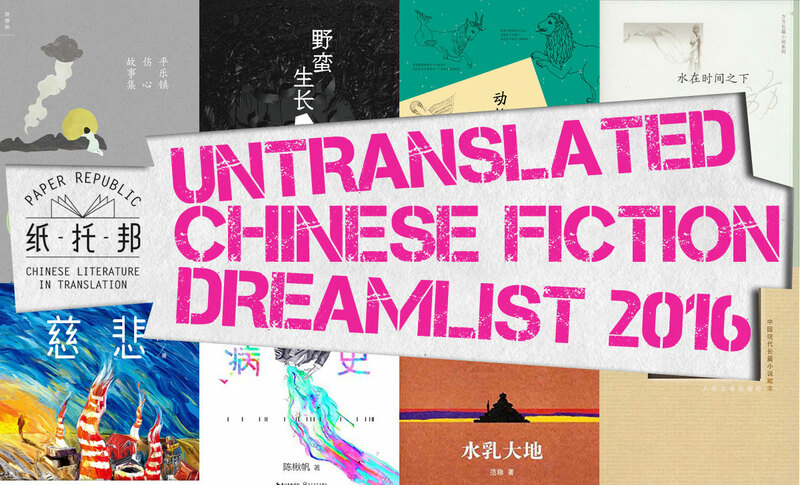 At the start of 2016, we decided to revisit the 2009 dream-list of untranslated Chinese novels recommended by the Paper Republic team. We wanted to see which of them had been translated (see update here), and to invite our readers to recommend titles for a new 2016 list. Translators and agents, if you are working on samples, we’d like to add this information to the database – we can tag them as “excerpts” - you can search for a list of excerpts here. If you tell us that an "excerpt” is available from [a named person or job-title] at [literary agency], we can add this too! Think of it as free publicity! Chinese Arts and Letters, vol. 2, no. 2 is out! Featuring authors Fan Xiaoqing, Qian Zhongshu, Dai Lai, Wang Dajin, Yan Huajun and Huang Fan.